Classroom is a powerful iPad app for teachers to guide students while they learn using iPads. Launch apps, books and websites on your students’ iPads to focus their attention. Lock screens, mute sound or observe screens – all from the teacher’s iPad. – Admin-created: Classes can be created in your Mobile Device Management (MDM) system and the Classroom app on teacher iPads is automatically configured with students ready for class. Student iPads need to be Supervised and enrolled in the MDM. 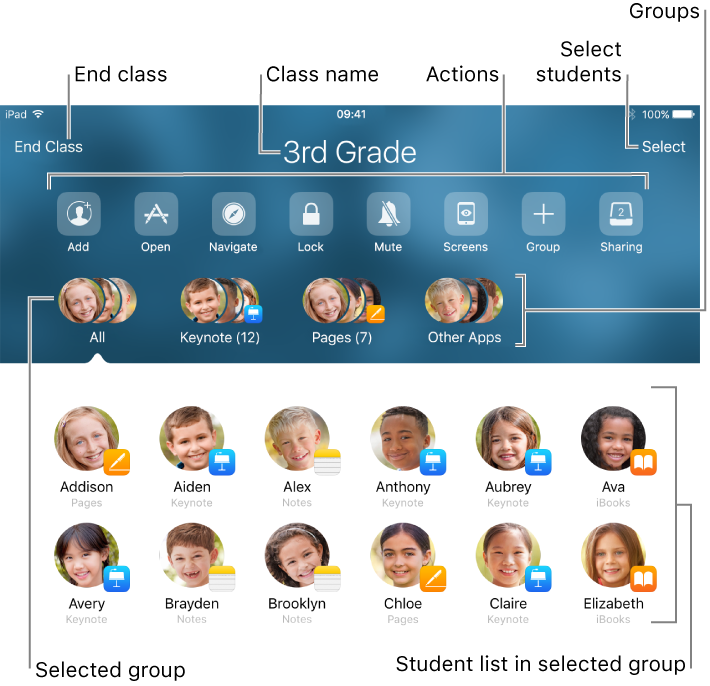 – Teacher-created: With Classroom 2.0 teachers can create their own classes and add students on their own with the app – no MDM or Apple ID required. Ideal for BYOD classes. Just remember, in teacher-created classes, students can ‘Deny’ teachers performing actions on their iPads, so there is a little more human ‘classroom management’ required. Using an MDM system you can prevent students from doing this. Classroom 2.1 has added a new ‘Student Activity Summary’, where a new screen presents a summary of student activity when the teacher ends a class session. Support for Drag and Drop to share URLs, documents and images is now supported on iOS 11. Apple Classroom requires an iPad 4th generation, iPad mini 2 or later, running iOS 10.3.2 or later. To take advantage of all features the latest iOS is recommended for both teacher and student iPads.